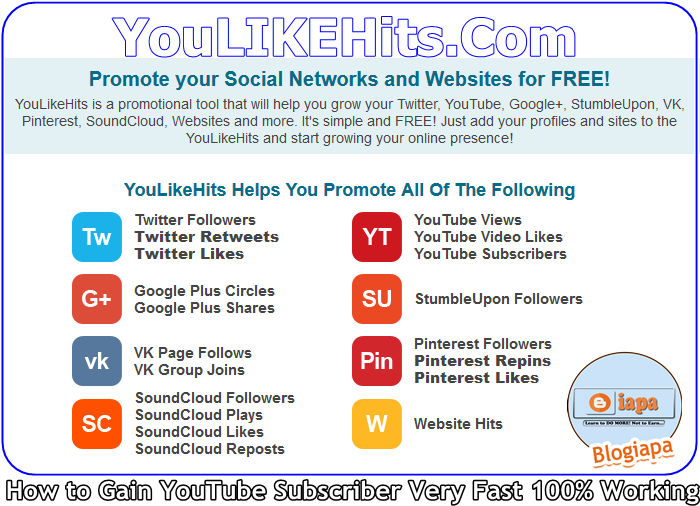 Today I'll tell you How to Promote your Facebook page/profile or youtube channel for subscribers and how to gain views from Youlikehits.com, all you do is Signup yourself on it and add your channel or page id for like, views, subs, comments for free. Salaam beautiful peoples, Today I'll tell you How to Promote your Facebook page/profile or youtube channel for subscribers and how to gain views from Youlikehits.com, all you do is Signup yourself on it and add your channel or page id for like, views, subs, comments for free. This is not a fake subscriber or bot inflated subscriber count, but active subscribers waiting on your next content. Passionate subscribers leaving a comment on your videos and sharing them with their friends, too. Getting subscribers for a new or struggling YouTube channel can be hard, - at least to the uninitiated - not to talk of MILLIONS of Real HUMAN subscribers. I think Youlikehits.com is no doubt the number one fan page like and followers website in the world right now with Alexa rank of 1511 this website got huge traffic. There are many plus points of this website which makes it so popular and that is they follow Twitter’s Rules and Facebook’s Policies. They will never Post Tweets or Status Updates from your Accounts and don’t ask for your account passwords. The signup process is very simple just provide a username, email, and password and you will get a confirmation code. Enter the confirmation code into the page after you log in and click Activate. After you log in for the first time, you will get 50 bonus points after each passing 24 hours. Not only you can get free Facebook fan page followers here but also you can get YouTube, Digg, StumbleUpon, MySpace and website hits too. How to Add YouTube Channel/Site. Now Click on "YouTube Subscribers"
In the Next Page "Put YoutubeChannel ID" and Give Payout Point to "10" for the best result. Now Goto "Earn Points" and Earn Points through watching videos or liking pages. Blogiapa - Learn To Do More! : How to Get More YouTube Subscribers?